...I have been working on a few things! This is the center of my Winter Wonderland. I'm adding the fly stitches between the center stitcheries so I can begin sewing the quilt together! Have you ever used these stick-on thimbles? I love them - they can be repositioned a number of times before the glue finally wears off - and they don't slip off your finger! This is going to be a neck warmer for a very tiny person! I am "testing" the pattern while waiting for the proper yarn. 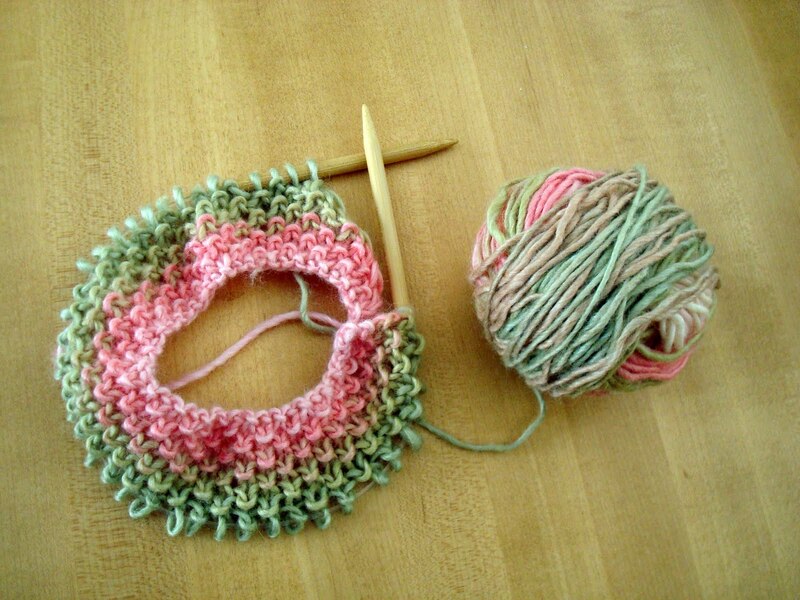 This yarn doesn't give the correct gauge, so I will be on the lookout for a little girl who might like to have this when its done! This wonderful stack of vintage squares was given to me last year by a very dear friend. I've come up with something to make from it - I'll surprise you later. This was our backyard on the first day of winter. More snow is on the way, so Santa will have a clear path to the Squash House! Speaking of Santa....he brought one present a little early - he didn't want the reindeer to carry such a heavy load on his busiest day of the year. 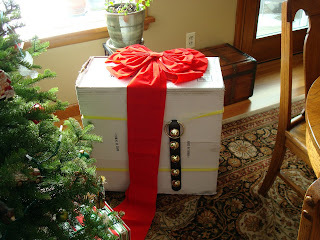 I love the wrapping - Santa gets more and more clever each year! I love you stitcheries. 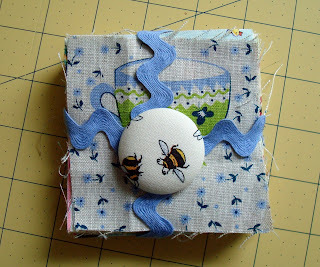 I've never tried made one before but I have some on my lists of projects for next year! You knit too! It looks like a beautiful start. I love the colors of the yarn. I love Santa's wrapping. Looks like a large package...I wonder what it is? :-) Merry Christmas to you and Mr. Squash! I think those bells were put on to warn Santa if you tried to peek early! Pretty yarn colors. Perhaps the little girl who shoveled your driveway? I think all the snow has been left in Washington! Wishing you and Mr. Squash the happiest Christmas ever. 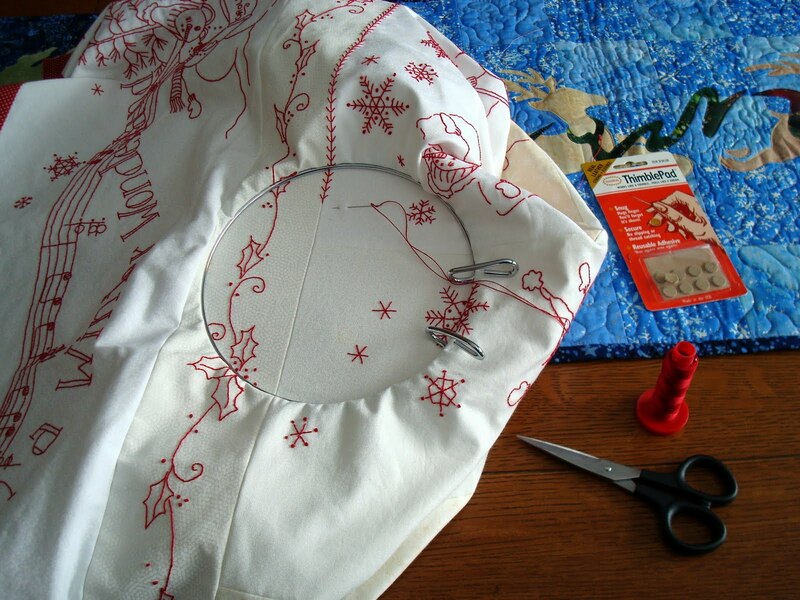 Love your embroidery project! Can't wait to see more. I don't knit but do love that yarn. Happy Holidays and Merry Christmas to you and Mr Squash. I like Santa's style *s* And with the sleigh bells, he'll be able to tell from another room if someone is being naughty or nice. 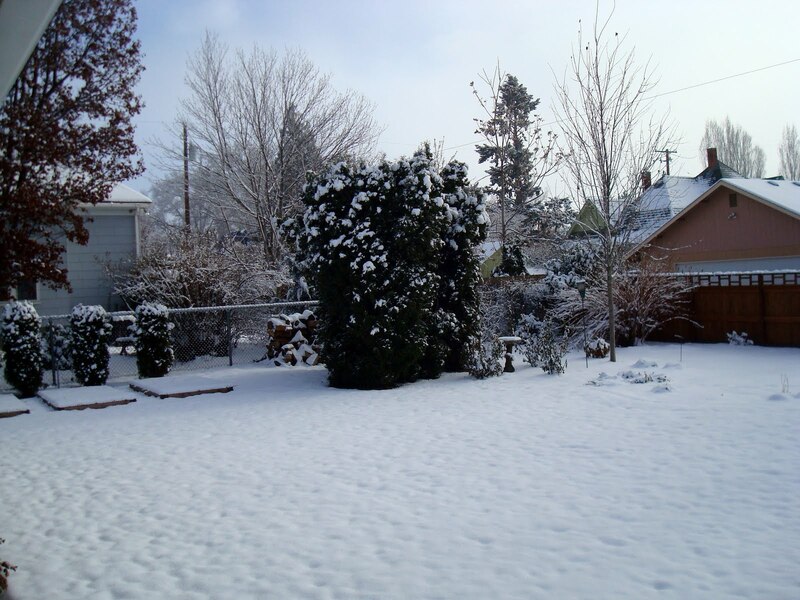 Your Winter Wonderland looks great! I quilted one for a friend a few months ago and now have the pattern to make one for myself. I made Winter Wonderland a couple winters ago when Primitive Gatherings did it as a Block A Month, but still haven't gotten it quilted. It was a lot of fun to make, though! Are you going to hand or machine quilt yours? I was thinking hand quilt, but maybe I should send it to Ruthie - sounds like she already has experience! The Winter wonderland is fantastic! Please, post some photos, when you'll finsih it! Thanks for sharing your lovely projects - I dream of doing Winter Wonderland someday. Finally have a minute to check a few blogs. Your small tree is so sweet. I have many many birds on my tree every year. Just kept collecting ornaments, over the last 46 Christmas seasons. I do use those little stick on thimbles and keep a pack of them in my on the go needlework bag. They come in handy when someone has forgotten their thimble at home. Merry Christmas to yourself and your husband. No snow for us yet. Oooo,I want to know what's in the box!!! You do such beautiful embroidery work! Your fly stitches are perfect! It's going to be beautiful. We have snow, too, and little ones comes for Christmas. Such a precious time. Merry Christmas to you and Mr. Squash!! Your redwork stitchery is gorgeous! You have us all curious as to what your early gift is. I have a feeling you're going to make us wait to find out! The snow is beautiful. I hope you have your neighborhood girls on speed dial. Looks like you'll need them. Happy Holidays Candace and Mr. Squash! 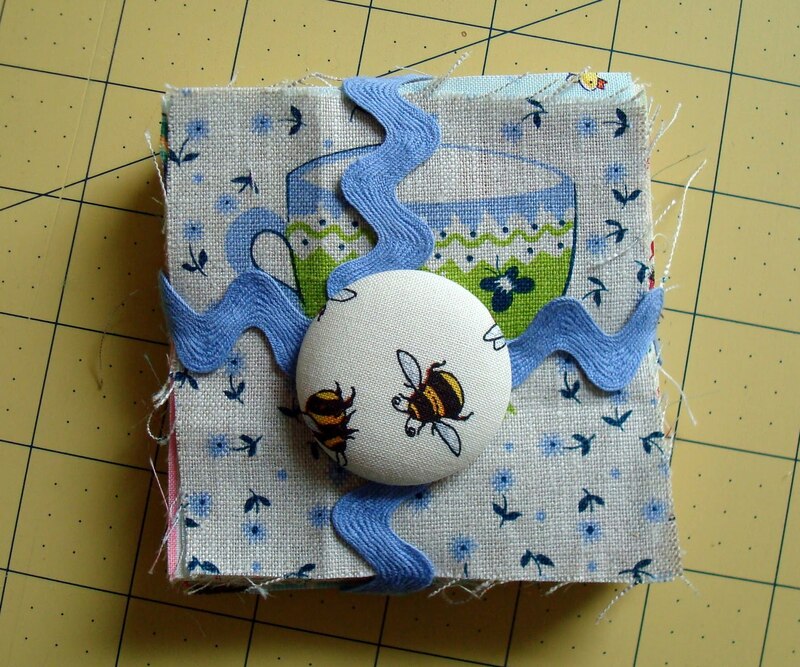 Your stitching is wonderful, I'm looking forward to seeing the whole thing. As for that big box, do you know what's in it? I am a bit worried though that Rudolph has left his collar behind. Winter Wonderland is the perfect thing to work while you are warm and cozy surrounded by your own winter wonderland. We might get some snow tomorrow night! Just wanted to take a moment to wish you and Mr. S. a very Merry Christmas. My daughter already set the table for tomorrow and the place mats make the table look so festive. Thanks again. Oh, I can't believe I didn't comment on this already, I must have gotten interrupted last time I stopped in. I think your stitchery is just beautiful. The stitched seams are especially nice. Thanks for the Memories & A Winner! Squash House Christmas & Giveaway! A Winner & the Littlest Snow Shovelers! Squash House 1 Year Anniversary & A Giveaway!